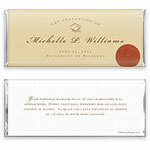 This classy wrapper is an ideal choice for any graduation celebration. Design: Diploma inspired design with elegant script and seal. Personalization: Front name, date and event with back message.